Are Bonds Trying to Tell Markets Something? Last Friday, the spread between the 3-month Treasury bill and the 10-year Treasury note went into negative territory (also known as a yield inversion) for the first time since September 2007. According to most economists, a yield curve inversion is the first reliable signal of an upcoming recession (a yield inversion has preceded each recession over the past 50 years). While the inversion last week (breaking the longest streak without an inversion at more than 3,000 trading days) has been the talk of the town, what it ultimately means for the economy and markets remains the million dollar question. For starters, a yield inversion does not spell impending doom for markets and the economy. Over the past 50 years, a recession has followed an inversion anywhere from 14-34 months after spreads have inverted. Back in the great financial crisis, the yield curve first inverted on December 30, 2005. The recession didn’t officially occur until 2008 and the S&P 500 rose 18.4 percent in the 18 month period following the inversion. In other words, while the yield curve inverting generally is reflective of an upcoming economic slowdown, it doesn’t mean investors should run for the exits. What should investors do then? For starters, make sure their portfolio matches their tolerance for risk. With recessions come a decline in earnings and thus stock prices tend to fall. The past two recessions (2000-2002 and 2008) saw areas of the market drop by as much as 50%. The time to stress test your risk tolerance is before a downturn sets in, not after. Second, history shows that value stocks have outperformed growth stocks over the long run. As the chart below shows, the past decade has not been kind to value investors. 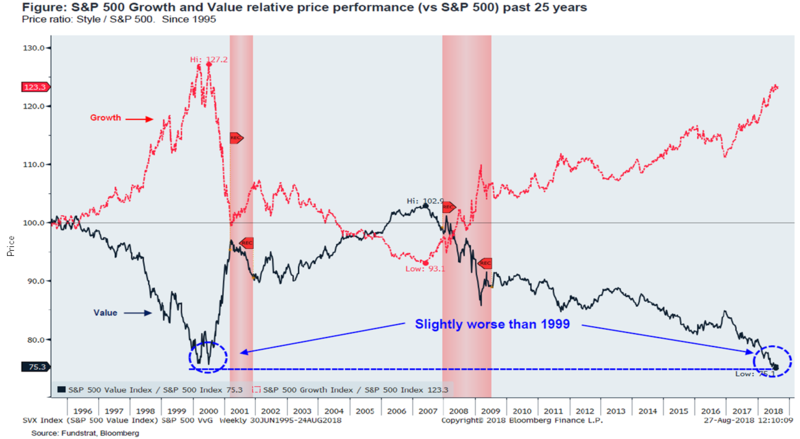 Value stocks tend to go down less during bear markets and, as a result, have less to recover coming out of the downturn. Investors that are overweight growth stocks should consider rebalancing to less cyclical and more defensive areas such as gold and consumer staples.